Adapted and excerpted from Stan and Jan Berenstain’s Down a Sunny Dirt Road: an Autobiography, published by Random House in 2002. It was when Stan and Jan’s then four-year-old son Leo asked for Dr. Seuss’ McElligot’s Pool for Christmas that it all started. We became Dr. Seuss fans. But more than that, his books scratched an old itch. We had for some time been thinking of doing a children’s book, perhaps even two or three. Dr. Seuss scratched that itch. We knew from our first noodlings that our book would be about bears ― a family of bears. We knew they would live in a tree. We don’t know how we knew, but we knew. We knew we’d have three characters: a bluff, overenthusiastic Papa Bear who wore his overalls and a plaid shirt and was a little like Stan, a wise Mama Bear who wore a blue dress with white polka dots and a similarly polka-dotted dust cap and was very like Jan, and a bright, lively little cub (Small Bear) who was a lot like Leo. Michael, not yet one, didn’t make the cut. It took us two months to write and illustrate the manuscript of our first children’s book. At the same time, The Cat in the Hat, Dr. Seuss’s epoch-making response to “Why Johnny can’t read” controversy was sweeping the country. 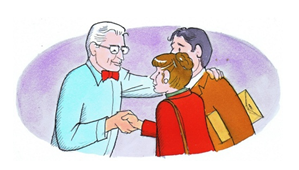 In seventy-two pages of rhymed, limited-vocabulary text, Dr. Seuss changed the way children learn to read in America. The book was so successful that it led to the development of Beginner Books, a revolutionary new line of easy-to-read children’s books. Beginner Books was a new division of Random House. Its trademark (and battle cry) was “I can read it all by myself,” and its president and editor-in-chief was Theodor Seuss Geisel, otherwise known as Dr. Seuss. After a contract was signed, we were summoned to New York for a meeting with the editorial board of Beginner Books. The board consisted of Ted (Dr. Seuss); Helen Palmer, Ted’s wife and a longtime children’s author in her own right; and Phyllis Cerf, wife of the chairman and co-founder of Random House (Bennett Cerf of What’s My Line). Though Ted didn’t wear a big red-and-white-striped top hat like the Cat in the Hat, he shared many characteristics with his feline alter ego. Like the Cat, he could be charming, courtly, congenial, and delightful to be with; also like the Cat, he could be demanding, dismissive, and downright difficult. Our first meeting began with introductions and pleasantries. However, a slightly disquieting sense of déjà vu hung over the exchange of pleasantries. No wonder. We were literally surrounded by Freddy Bear’s Spanking. It was plastered all over the walls―thumb tacked in sequence to large corkboards mounted on three walls of the small room. It’s called storyboarding,” explained Ted. “It’s a movie technique. I learned it from Frank Capra. It really lets you get a sense of how the story’s working.” If it was good enough for Frank Capra, it was good enough for us. “We like your bears. We think they’re fun,” Ted continued. “We like the idea of a family. “And we love your drawings,” said Helen. Ted smoked. We didn’t. There was no way Papa Bear was going to smoke. After nursing our wounds and feeling sorry for ourselves for a few days, we got to work on draft number two, which, over the months, was followed by draft number three and draft number four. Our modest dream of doing a funny book about a family of bears who lived in a tree was turning into a walking nightmare. We were dutifully cranking Ted’s recommendations into draft after draft. Helen and Phyllis finally called a halt to all the changes. They suggested that the honey-hunting sequence in the original story had survived all the changes. Why not, they suggested, take that sequence and expand it into a whole book? We went home and started from scratch. The new story told about the Bear family’s waking up to an empty honey pot one morning. Papa and Small Bear take the empty pot and set out in search of honey. A bee flies by. Papa and Small Bear “follow that bee and follow that bee and follow that bee to its honey tree.” But when they get there, the bees rise up and chase Papa into a pond. On their way home, Papa and Small Bear buy some honey at the honey store, which was what Mama wanted them to do in the first place. We roughed out the story and sent it to Ted, who thought it was just fine. “Go ahead with the finish,” he said. The fever had broken. The crisis was past. We had our Bears back and all was right in the tree house. 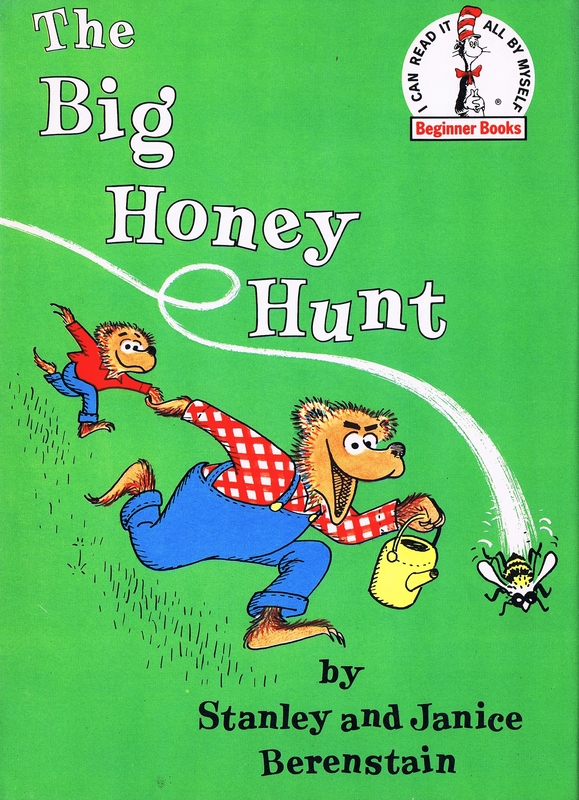 The Big Honey Hunt was published in the spring of 1962. I have loved The Big Honey Hunt since I was eight. It is a classic and a cracker of a children’s story. My daughter loves your stories and we’ve been reading your books since she was 2 years old. She’s now 8 and still reads your stories. We wanted to see if you ever provide signed copies of your books? If so, please let us know and how we could obtain one! Thank you so much for your very nice comments. Unfortunately since Jan’s death in February, 1/2 of the Jan and Mike drawing team has been lost. With the number of requests for signed copies, and Mike’s incredible work load now, he has had to stop signing copies. We are sooo very sorry that this is no longer possible. Please give your daughter a *bear hug* from us. Just an FYI, since your daughter is 8, we now have a number of delightful chapter books for first time readers available as e-books from all e-retailers. Hi. 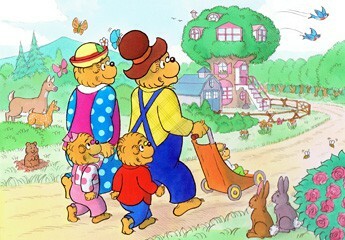 Berenstain bears have been a staple in our house since our first foster child came to us nearly 3 years ago at 2 1/2. We would just find a story about whatever she is preparing to face (the doctor, first day of kindergarten, welcoming a new baby…). Now she is 5 and we happened upon the chapter book about the shaggy little pony and realized that it was jan and mike writing, so I had to find out more. Our 5 year old adores the story by the way and so do we. The pacing is perfect. So I have been mining your site today, reading about how all these stories came into being. I’m sorry to read about Jan’s death last year. How amazing to work so closely with her as your own life’s work. Thank you again for your family’s contribution to the well- being of mine. We are moving to a new house and my 3 year old daughter wanted to decorate her room in Berenstain. I can’t find any merchandise on-line except books and quilts. Why not? I have used used ‘The Berenstains’ B Book’ and ‘C is for Clown’ to introduce the letters B and C and the sounds to my Pre-Kindergarten class. 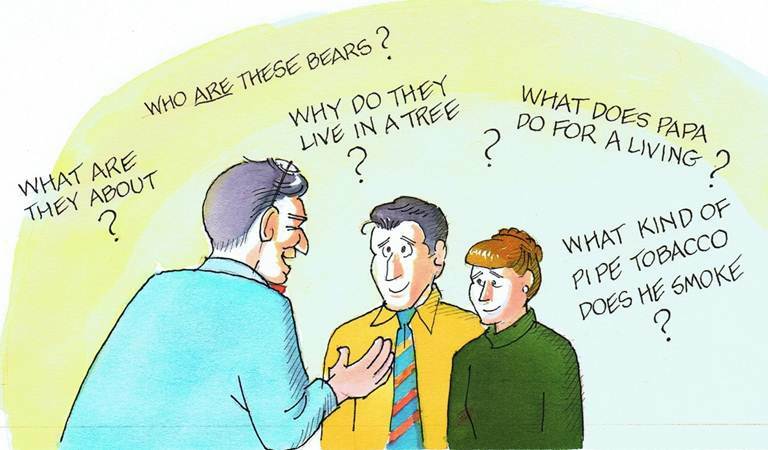 I use several of other Berenstain books and videos to introduce or highlight many concepts to my classes as well. I recently discovered you also have a book about the letter A. Do you have any other books focusing on specific letters and if not do you plan on every creating more? Thanks for your note, Stephanie. Glad you discovered the A Book recently. Those 3 were part of the Bright and Early series and the only 3 letters published. You might note that your C is for Clown (1972) was the early version of the C Book (1977). The publishing schedule through 2015 does not include anymore specific letter books. Thanks again for your note. We should be asking you that question! 😀 We love all our adventures!